North Wales police boss urges fans to behave so bubble can be burst for good | News by Wales Express News, People Before Profit! A football-loving police boss has urged fans to be on their best behaviour for the first bubble-free derby match between Wrexham and Chester for years. 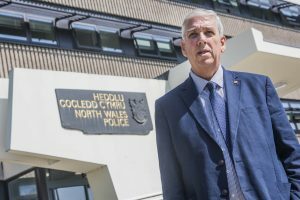 North Wales Police and Crime Commissioner Arfon Jones campaigned for controversial travel restrictions to be lifted on the fixture which features the closest international rivalry in British club football. Arfon Jones, the new North Wales Police and Crime Commissioner at Police HQ in Colwyn Bay. The plea to the supporters from Mr Jones, a Wrexham season ticket-holder, comes ahead of the latest meeting of the old rivals at the Swansway Chester Stadium, on Wednesday evening, November 8 (7.45pm kick-off). Football fans across the country will be watching as the all-ticket Vanarama National League derby is being televised live by BT Sport. The so-called “bubble” classification meant in recent years that all away fans had to travel to the game on designated transport – usually club coaches – from specific pick-up points although the two clubs are just 14 miles apart. The last meeting of the sides was a 1-1 draw at Chester on January 21 last season when Chester had their highest attendance of the season, 3,961, and the match passed off without incident. Mr Jones said: “I would like to urge both sets of fans to be on their best behaviour for this fixture. “Whilst I am pleased that normal policing arrangements are in place for this game, it would have been better if the match was played at 12 noon on a Saturday or Sunday and not in the evening, TV rights should not take precedence over public safety. “I was always of the view that there was no need for travel restrictions on the match and I had made both Cheshire and North Wales Police aware of my views. “I am pleased to say that the supporters of both Wrexham and Chester have justified my confidence in them and shown that these games can be played in an atmosphere of friendly rivalry. “We want fans to go along to games with their friends and cheer on their teams and chant and sing – it’s what gives our football its vibrant and passionate atmosphere. Last season the two police forces and the clubs said that the restrictions would be reviewed at the end of the season with a view to ending the bubble status of the game as long as the matches passed off without incident. There had been a history of trouble between the two sets of fans and the travel restrictions were imposed by the two police forces in the interests of safety. Mr Jones added: “The fans behaved impeccably last season at The Racecourse and at Chester and I hope there will be a really good atmosphere at the game at the Swansway Chester Stadium. “If things go well again then hopefully the fixture will continue to take place under normal conditions which will be a great result for both clubs and both sets of fans.